Johnny Lujack, Terry Brennan, Emil Sitko, John Panelli – to name a few – made the yardage and the headlines, but their paths to the end zone were strewn with the blood, sweat and humor of linemen like Zygmont Czarobski. Coming out of Chicago’s Mt. Carmel High School, Czarobski played at Notre Dame before and after the war, helping the Irish win three national championships. In the last two post-war years of Czarobski’s career, Notre Dame won 17 and tied one, the storied deadlock with Army. 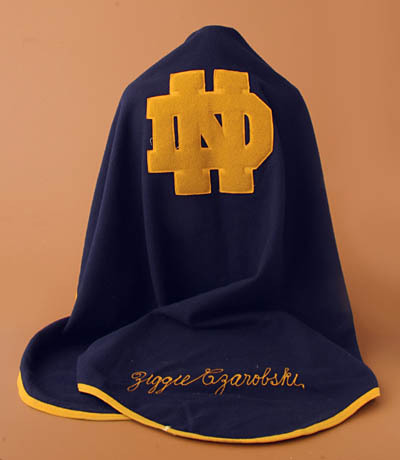 Czarobski was a 1947 All-American. He walked with the best of them and somehow managed to stay a step ahead of the field. His teammates were legendary figures: John Lujack, Terry Brennan, Emil Sitko, John Panelli to name a few. They made the yardage and headlines; the linemen made the paths. Paths strewn with blood, sweat and tears, paths that led to the goal line and lucrative pro football contracts. Even in the galaxy of stars, Zygmont Czarobski stood out. Mostly because he was just Ziggie Czarobski, a fun guy with a tremendous amount of talent for playing football and enjoying it. Ziggie’s football career covered two separate eras, before and after World War II. He went to South Bend from Mt. Carmel High School in Chicago, a regular pipeline for Fighting Irish talent. His credentials were excellent having earned All-State honors in football-rich Illinois three years in a row. He played on three national championship teams at Notre Dame and helped turn coach Frank Leahy’s curly tresses white. Fun-loving was not the type of designation Coach Leahy liked for his players, but in later years the coach admitted Ziggie was a good influence on his team. When the 1946 team assembled, Leahy found one of the most talent-laden college football teams ever on one field. But it was not a group of recent high school graduates eager to make the Notre Dame team. They were two, three and four years older than usual. They had been through tough campaigns in the Pacific islands and the trenches of Europe. The war showed them the value of a college education and that’s why they were at Notre Dame. The coaches who took these “grizzled” veterans of a bigger battle and forged them into a championship football team had real genius. In the last two post war years, Ziggie’s team won 17 games and tied one – certainly a Hall of Fame accomplishment. After coming out of the service in the war, Ziggie and teammate Gus Ciffeli reported to spring practice a little overweight, about 100 pounds split evenly between them. Leahy was horrified. “You must each lose 50 pounds and check in at 229 for the opening fall practice,” the coach informed the two players. At the first formal session in the fall, Leahy lined the two of them up in front of the scales. When both Ziggie and Ciffeli hit the proper mark, Leahy turned away from the scales and did not notice Johnny Lujack and the rest of the players on the team all hit the exact same 229 mark. The two “heavyweights” had rigged the scales! Notre Dame football coach Frank Leahy was known as a tough man who guided the football destinies of not only the young players, but also the “veterans” who had returned from the armed forces after World War II. Included among them was Ziggie Czarobski. Ziggie was known for his wit and one of only a few players who could get away with a little more than other players with Leahy.